The 4th Sunday of Great Lent, the Sunday of St. John of the Ladder, coincided this year with the Feast of the Holy Annunciation (25 March /7 April). 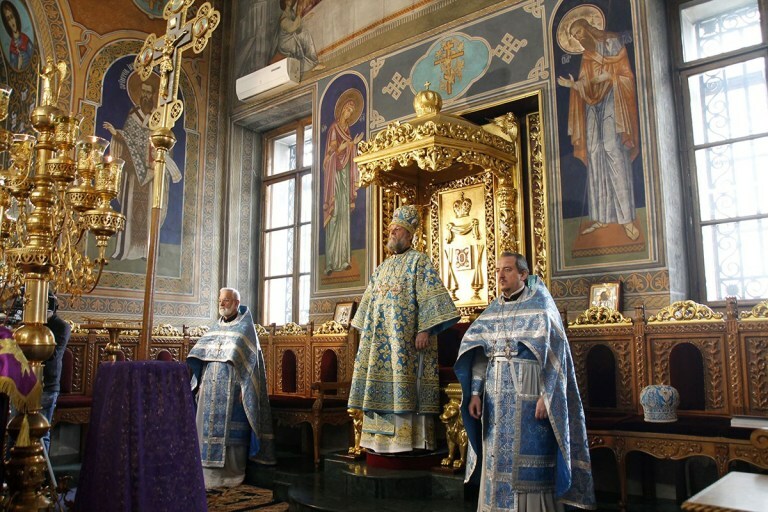 Metropolitan Vladimir of Chisinau and Moldova conducted the celebration of the Divine Liturgy in the Metropolitan Cathedral in Chisinau, assisted by the Cathedral Dean, archpriest Vadim Cheibas, and the synaxis of priests and deacons of the holy shrine. The Holy Annunciation is the Feast when Heaven and Earth rejoice, for the blessed news of the coming of God-Logos among people was announced to Ever-Virgin Mary by Archangel Gabriel. This event was awaited by the humanity sins Adam was cast away from Eden. “Rejoice!” – is the greeting that our Most Pure Theotokos heard from the Archangel. “Rejoice!” is what we hear today, for we are among the blessed ones who experience the coming of God. Holy Annunciation is among the first events celebrated by Christianity. The Church produced most beautiful hymns and services in honour of this feast. Thus, the Akathist Hymn of the Holy Annunciation appeared in the 5th or 6th c. in Constantinopol. The chronology of feasts, like the Nativity of the Lord, the Circumcision of the Lord, the Meeting of the Lord, the birth of Holy Prophet and Forerunner John Baptist, are connected to the celebration of the Feast of Annunciation. This was a very special Liturgy for young Mihail Cepraga, 3rd year student at the Academy of Orthodox Theology in Chisinau, who was ordained deacon by Metropolitan Vladimir. Numerous church-goers participated in the Divine Service, communing with the Body and Blood of Christ. The service was cast live on Tele-Radio Moldova, while liturgical commentaries were provided by journalist Iulian Proca.